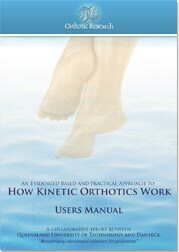 An evidence based program designed to enhance practitioner understanding of kinetic tests and observations and how they relate directly to orthotic prescription, design and review. Clinical tests are animated in 3D allowing course participants to thoroughly evaluate and practice them so as to validate their understanding. Following this process, case studies are included which allow you to then evaluate this understanding and how it applies to application design selection to optimise patient outcomes. The course is delivered over a six week period of self directed learning with a minimum of 10 hours of study time. This CPD programme would qualify for the equivalent of 10 hours of CPD activity under either "Further education" (maximum 10 hours) or "self-directed learning" (maximum 10 hours) categories according to the Podiatrist Board of Australia guidelines for continuing professional development. This course was a developed over 2 years by the Queensland University of Technology in collaboration with industry. The course went online in March 2012 and is up to date with the latest research and application design methodologies. You require a regular desktop or laptop computer running Windows or Macintosh. Mobile devices such as iPads are not supported at this time. The total cost is $550 inc GST. This provides you with complete access to the online course and a certificate will be issued to you on completion. Please choose a password. It must be at least 5 characters in length. The total cost for the course is $550 inc GST. Credit Card Number We only accept Visa and MasterCard (no surcharge).